Inky Paws Challenge #28 Winners! Thanks so much to everyone who entered our last Inky Paws Challenge at here at the Newton's Nook Designs blog! This months Challenge was a LOVE THEME! There were so MANY amazing LOVE cards this month! THANK YOU to everyone who entered! All the awesome entries always make it difficult to choose the winners! Our first top pick is this adorable card is by Janette Kausen! We love how she created a shaker card using tulle over a watercolor background! It's the perfect backdrop for those snuggly kitties from our Darling Duos stamp set! Our second top pick is this pretty pink card by Peggy Gottschau! 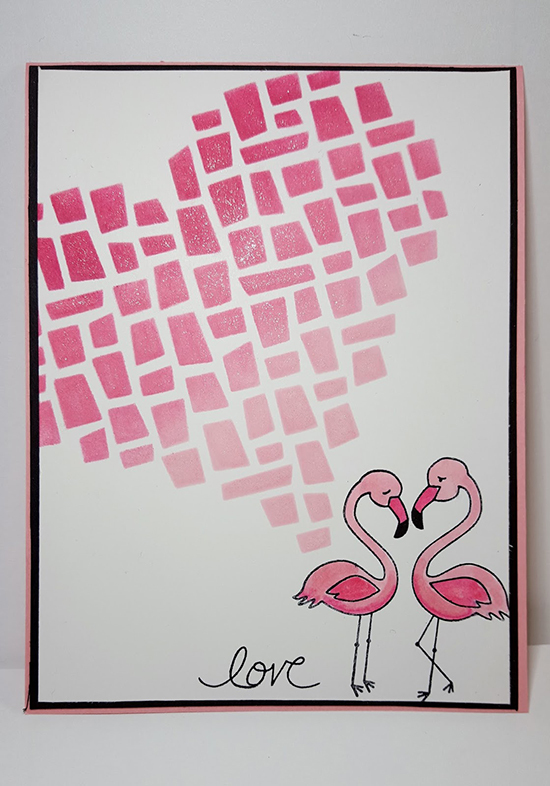 We loved how the sweet flamingo pair is nestled under that big pink stenciled heart! She use the flamingos from our our Flirty Flamingos stamp set! So adorable! Congrats to Janette and Peggy! Don't forget to send us an e-mail at info@newtonsnookdesigns.com to claim your $10 store credit and get your winner badge for your blog! This Valentine by Diane made us smile! We love how she used the alligator from the Beach Party stamp set and created a cluster of balloons using the "love" sentiment from the Winged Wishes stamp set! We loved all the layers and fun colors on this card by Tara. That distress background is super fun. Check out her site for a fun video on how she did this. 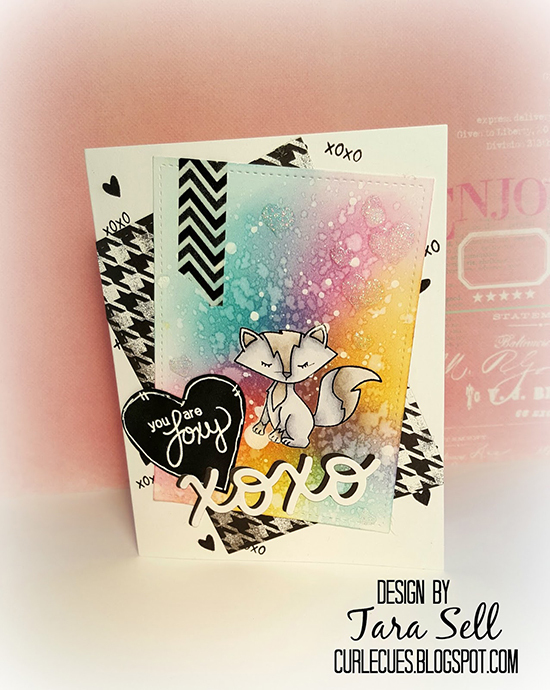 She used our Sweetheart Tails Stamp Set for the fox image and sentiment. And one more favorite - We loved the way Dawn combined the flamingos from our Flirty Flamingos Stamp Set with the Eiffel Tower from the Newton Dreams of Paris Stamp Set! The way she colored the grass is so pretty too! Thanks again to everyone who entered - It's really so much fun to look through all the entries and see everyones ideas! If you didn't win this time we hope you'll play along again next time! 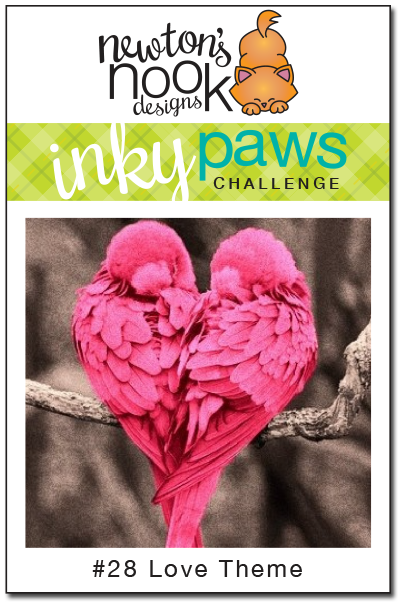 Our next Inky Paws challenge will begin in a couple weeks - on Friday, February 19th! Congrats to the Winners! Don't forget - you have 7 days from today to to e-mail us at info@newtonsnookdesigns.com with your full name and email address to claim your prize.